Flystrike Spam Interrogator allows the user to test e-mail messages before downloading them from the POP server. Flystrike Spam Interrogator is designed to filter e-mail messages on the user's server according to a specific inventory. Unwanted messages can be banned according to URL links they might contain, or a hash code identifier. The most important feature of Flystrike Spam Interrogator is that it enables the user to automatically transfer the Original Message Headers, and Original Content to an abuse report that can be relayed to either abuse departments or the police. How do you use Flystrike Spam Interrogator? Flystrike Spam Interrogator is your expeditionary force. It is run first to check your remote server and delete unwanted messages. You still use your conventional e-mail client to download the messages; but only after Flystrike Spam Interrogator has done its work. To run the Interrogator manually you open each account in the tree. The Interrogator dialog will open and begin the interrogation automatically. As the user bans unwanted URLs the automatic deletion proceeds with ever increasing efficiency. By default, the URLs you choose to ban will not trigger an auto deletion so mistakes that might cause the accidental deletion of desirable messages do not occur. False positives are far less likely to occur once you have entered your client and friends addresses. When you have become confident in your use of Flystrike Spam Interrogator then go ahead and set the auto-delete options in Program Settings. 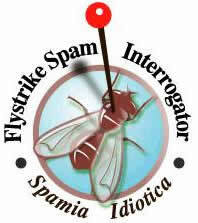 Flystrike Spam Interrogator will be a powerful weapon in the fight against spam. eMail Previewer - Stop downloading SPAM and stop email spam Viruses into your email program.